Spices and herbs are great flavoring agents you can easily use in a variety of ways to prepare healthy meals. The tastier you make your healthy meals, the more likely you will eat and continue cooking healthy meals. And just as there are many fruits and vegetables to choose from, there are also many herbs and spices we can use to add some powerful flavor to very simple meals. One of these spices is cumin, which is grown from the seed of the herb plant cuminum cyminum (part of the parsley family). You can buy either whole seed cumin (which generally comes in black, white or amber colors) or ground cumin seed. Cumin, called “Jeera” in Hindi, is a very popular spice used in many different types of cuisines, including Indian, Mexican, North African and Middle Eastern. Cumin is one of the main ingredients in curry powder, and according to some reports is the second most popular spice in the world, right behind black pepper with the winning title. Cumin is reportedly native to the East Mediterranean to East India. It is a very aromatic, versatile spice with a strong earthy, spicy-sweet flavor. I have used cumin to flavor soups (like lentil soup), stews, rice and vegetables. I even add it to Greek yogurt to make a savory yogurt dip, which I can pair with raw veggies for an easy, healthy snack. Cumin is also great in hummus and guacamole. Cumin is one of my favorite spices and as I researched more about it, I found out it has been used for thousands of years in different parts of the world for medicinal purposes, including in Ayurvedic medicine. In addition to this, “[i]n Iranian traditional medicine, cumin is considered stimulant, carminative and astringent and its therapeutic effects have been described on gastrointestinal, gynecological and respiratory disorders, and also for the treatment of toothache, diarrhea and epilepsy,” according to the National Institutes for Health (NIH). The main compound in the essential oil of cumin is called cuminaldehyde, which is responsible for the strong aroma of cumin. “Cumin essential oil has multiple pharmacological actions including antioxidant, antidiabetic, anti-inflammatory, antibacterial and anticancer effects,” according to a report from the Journal of Pharmacology & Clinical Research. So let’s further explore some of the potential health benefits of this sensational spice. 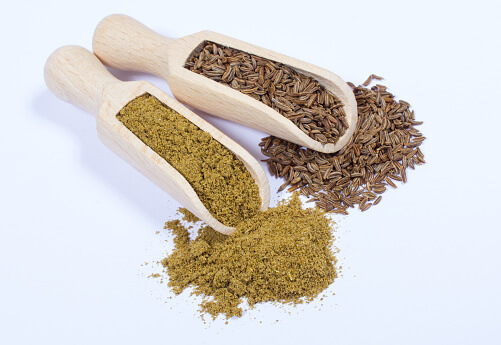 Cumin may help aid digestion and help soothe gastrointestinal discomfort. Cuminaldehyde reportedly activates, due to its strong scent, the salivary glands in the mouth. Saliva is key in the digestion process for a number of reasons, including its role in breaking down food. Cumin also contains a compound called thymol, which reportedly stimulates the glands that secrete acids, bile, and enzymes responsible for complete digestion of the food in the stomach and intestines. This may also help your body better absorb nutrients from the foods you eat. Cumin may also help your liver eliminate bile, making it a great overall body detoxifier. Cumin is a natural carminative (a drug used to relieve gas and bloating). And since cumin has antiseptic and anti-inflammatory properties, it may help prevent and relieve spasms in the stomach that can cause abdominal pain and prevent the overgrowth of bacteria that can cause an upset stomach and diarrhea. Many reports recommend making cumin tea, by boiling about a teaspoon of cumin seeds and straining the water out. You may sip this in between meals or when you are feeling any digestive discomfort. Cumin may help manage diabetes. Several reports praise cumin for its ability to keep blood glucose levels under control, by increasing insulin production in the body. “It has been reported that cuminum cyminum has antidiabetic effects as it was effective in reducing elevated blood glucose levels, enhancing insulin secretion and exerting antioxidant protective effects on insulin secreting β cells in diabetic rats compared to clinically used oral hypoglycaemic agent glibenclamide [an antidiabetic medication],” according to the Journal of Pharmacology & Clinical Research. It is, however, very important to talk to your doctor about consuming cumin if you are diabetic and taking medication to treat your diabetes. You don’t want your blood sugar to get too low, and this could happen if you are consuming a significant amount of cumin as well as taking antidiabetic medication. Cumin may help fight cancer. Since cumin has antioxidant and anti-inflammatory properties, it may help reduce oxidative stress (one of the main causes of chronic inflammation) from free radical damage. Chronic inflammation is believed to be a major contributor to all types of cancer. Another study, published in Food and Chemical Toxicology, tested nine plant products, including cumin seeds, to see which ones had the most powerful anticarcinogenic effects of squamous cell carcinomas in the stomachs of mice. Researchers found that cumin seeds and basil leaves were the two most powerful. Cumin may help with weight management. A study, supported by the National Institutes for Health (NIH), involving 88 overweight/obese women reported that daily consumption of cumin for only three months was associated with weight loss. The women were given three grams of cumin powder with yogurt at two meals, on a daily basis for three months. The control group of women was given the same amount of yogurt for the same amount of time, with no cumin. The results revealed that the group who consumed the yogurt with cumin had reduced serum levels of fasting cholesterol, triglyceride, and LDL (bad) and increased HDL (good). Weight, BMI, waist circumference, fat mass and its percentage were significantly reduced, according the study. Cumin may help with insomnia. Cumin may help boost your immunity. Since cumin has antimicrobial properties and may help fight bad bacteria, viruses and fungi, it may help better protect you from the common cold or stomach bug. Cumin may also help prevent yeast infections in women. Some reports say you can also apply cumin topically to treat boils (a type of skin infection), acne, psoriasis and eczema. Speak with your dermatologist before you attempt to treat a skin condition or any kind of infection with cumin, however. If this isn’t enough to make you run to your spice cabinet to see if you have cumin, check out some of the essential nutrients in just one tablespoon of whole cumin seeds. Calcium, 56 mg. An adult between 19-50 years of age (male or female) in general should aim to have about 1,000 mg. of calcium per day. This mineral is needed to build and maintain strong bones and teeth. Calcium is also needed for clotting of the blood to stop bleeding and for proper functioning of the nerves, muscles and heart. The National Cancer Institute conducted a study that monitored calcium intake in 135,000 men and women. The subjects who had a calcium intake of more than 700 mg. per day had a 35-45% reduced risk of cancer of the distal (lower) part of the colon than those who had a calcium intake of 500 mg. or less per day. Magnesium, 22 mg. This mineral is needed by more than 300 human body enzymes to facilitate biochemical reactions. It helps create energy for the body and activates muscle and nerve tissues by enabling potassium and calcium transfer through your cell membranes. If magnesium levels in the body are too low, whole body systems don’t work properly, resulting in fatigue and cramps. Phosphorus, 30 mg. This mineral works with calcium to help build strong bones and teeth. It is also needed to help balance and use other vitamins and minerals including vitamin D, iodine, magnesium and zinc. Sodium, 10 mg. When it comes to enzyme operations and muscle contractions, an electrolyte like sodium is SUPER important! Sodium regulates the blood and protects the body from body function impairment. Sodium also regulates body fluids, while transmitting electrical impulses in the body. Generally, including cumin in your diet is safe and healthy. But if you are pregnant, breastfeeding or have any medical conditions, it is always recommended to speak with a competent doctor about what you are putting in your body and the foods you are eating. For instance, some reports say consuming excessive amounts of cumin could cause a pregnant woman to have a miscarriage. Other reports also say that excessive consumption of the essential oils from cumin could cause liver and kidney damage. Additional side effects of eating cumin include heartburn. A typical daily dose of cumin is around 300 to 600 milligrams per day but, again, speak with a doctor. Do you cook with cumin? What are some of your favorite spices and herbs? Please feel free to share your experiences with us.